I am so so so excited to share today’s post! Our mom had an advent calendar when we were little kids (with one candy per day) and it is such a sweet and special holiday memory for me. I knew I wanted to make an advent for Nova’s second first Christmas (last year we returned home from China the week before Christmas and she doesn’t remember it, so we call this her second first Christmas—kind of fun to get a redo!). Anyway! I knew I wanted to do something we could keep for a long time and use every year. So I was OK with spending a good amount of time and work on it. I spent wayyyyyy too much time scrolling ideas on Pinterest (so fun!) and I kept feeling drawn to the stockings. So I did my own set with my favorite colors and lots of unfinished wood, which is a current design obsession for me. I had SO MUCH FUN working on this. It could totally be done in a weekend, but I spent about a week on it since I get distracted a LOT. Let’s talk about the DIY steps. This is E-A-S-Y. There’s nothing in this that you can’t just see from the photos, but I will still explain all the steps just in case you’re curious about exactly how I did it. 1. 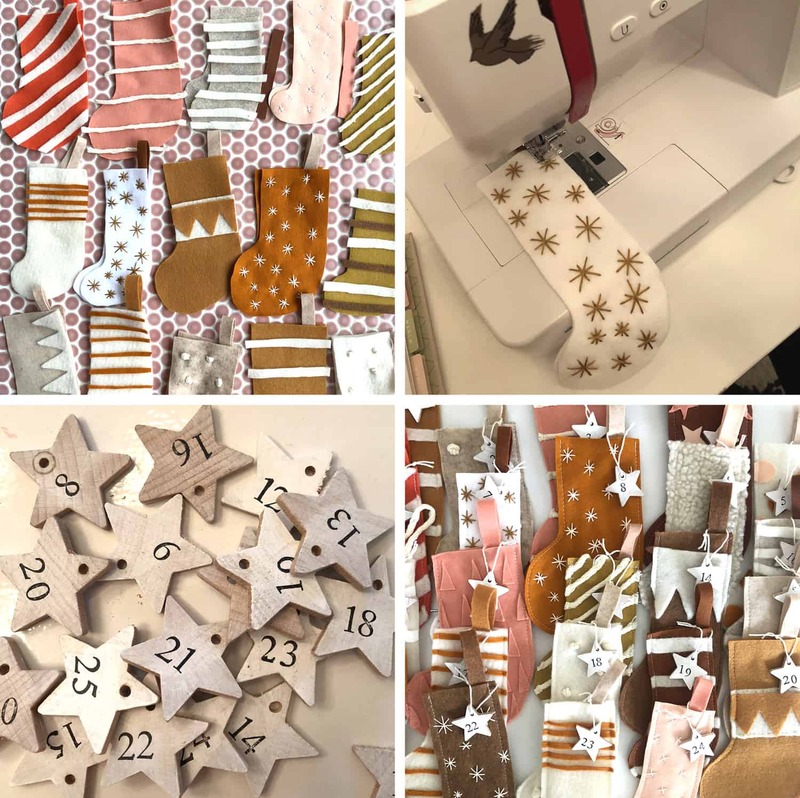 First, cut out 24 stockings from felt. I mainly used felt I already had, so it’s a mix between high and low quality (and I’m a-OK with that!). 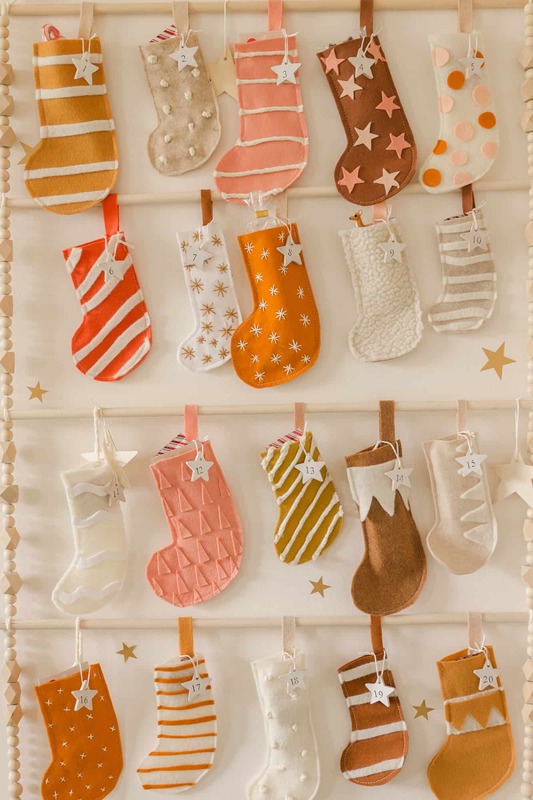 I made a few paper templates for stocking shapes and used them to cut out all the stockings. I didn’t want mine to be exactly the same shapes and sizes, but you can do that if you want a more unified look. 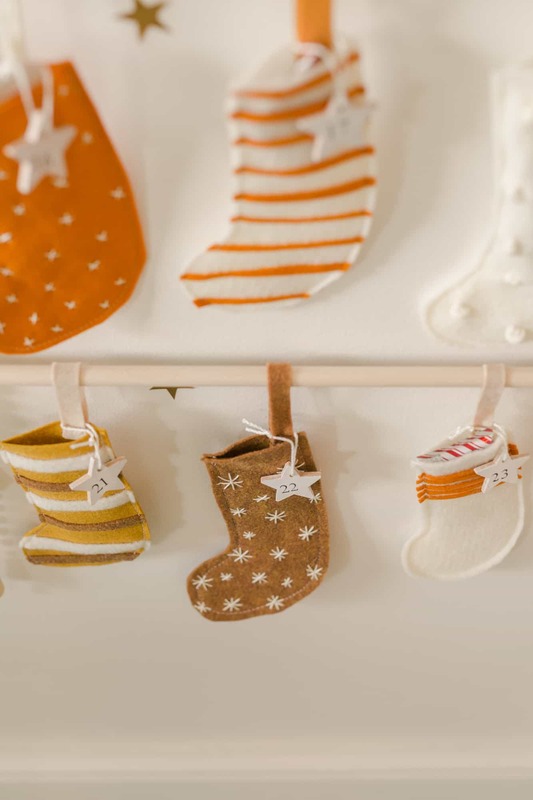 Next, embellish each stocking on the top side with hand embroidery and/or by glueing things onto the stockings. 2. 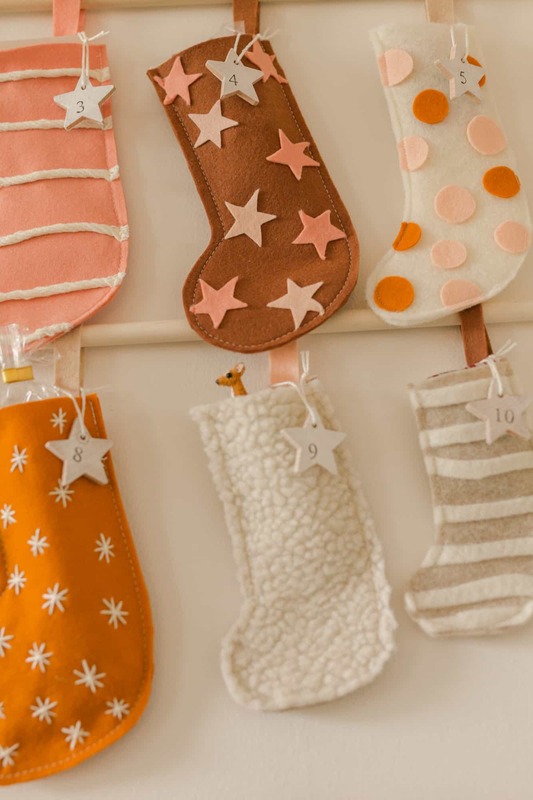 Machine stitch or hand-stitch each stocking. 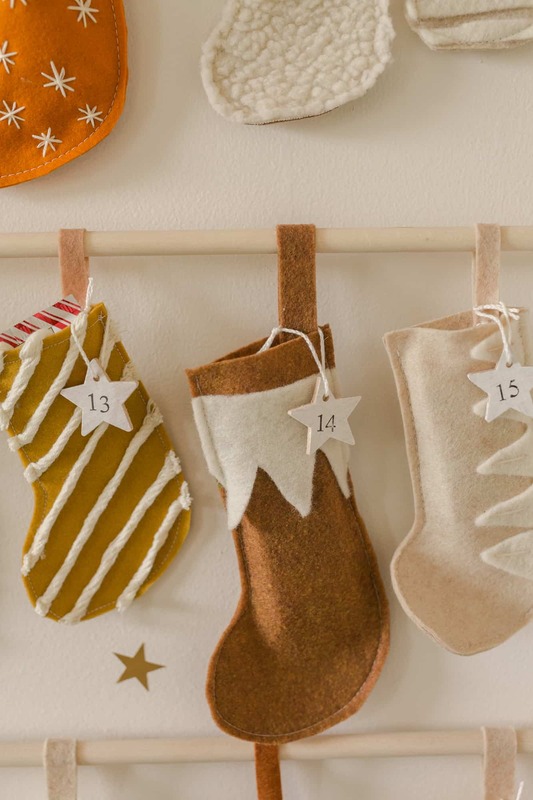 Next, add a loop to the top of each stocking with felt or yarn (something to hang them from). 3. 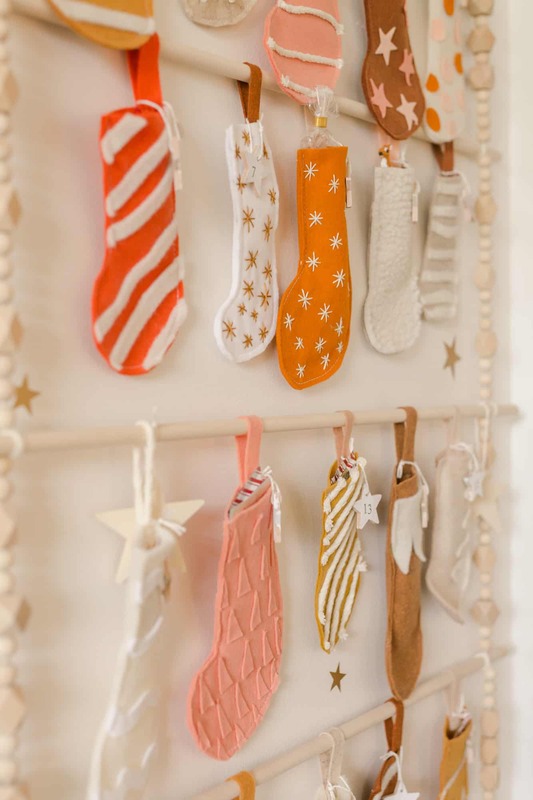 Paint small wood stars white and drill or punch holes. Use a stamp set to add numbers one through 24. 4. 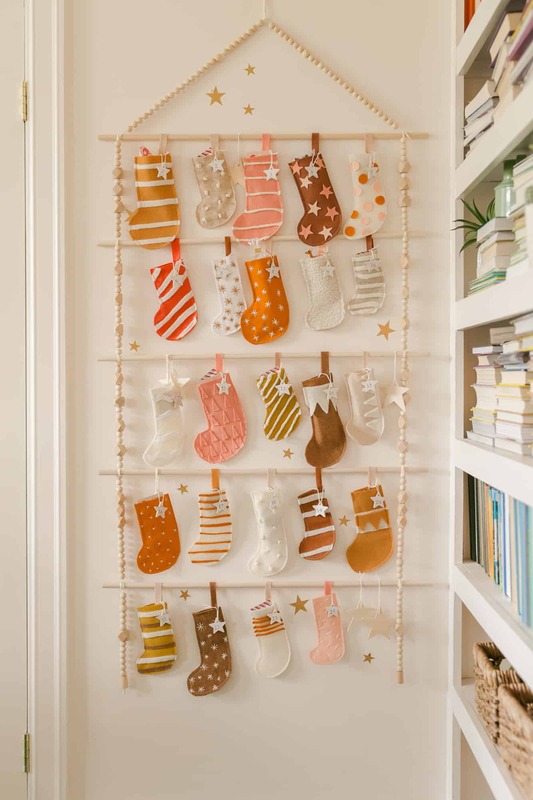 Add the stars to the stockings with string. 5. 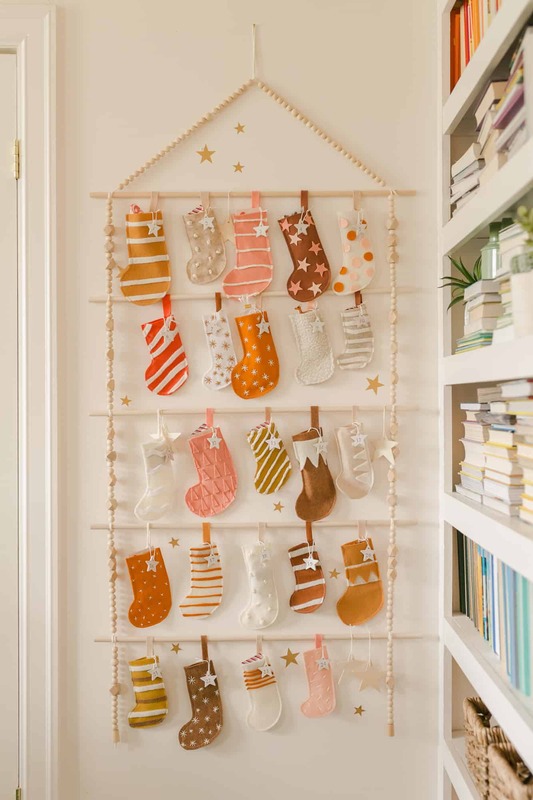 Use wooden rods, yarn, and wood beads to make the hanging structure. You can see below that my stockings are permanently attached to the rods, but you can tie them on instead if you’d like to be able to remove them each day. Bonus step: After I was done, I wanted to add a little more detail, so I hung a bunch of larger wooden stars on the rods. 6. Fill your stockings with candy, teeny little toys, and notes with fun activities like movies to watch, crafts to do or special places you will go each day. MY HEART!!!!!!! I had so so much fun working on this and I am so excited for December 1 so Nova can start experiencing it! I hope some of you will make this project this year and in years to come. I would LOVE to see your version of it in colors that you choose, so please tag us on Instagram @abeautifulmess.